Mark was lucky enough to have a Dad who was a regular racegoer when his son was growing up, and from age twelve the youngster was first into the car on race days. At that time, John Newnham was a prominent name in the newspaper business, serving as Sports Editor and later as Advertising Executive for the Sydney Morning Herald. Young Mark was known to the racing press at all four metro tracks and would sometimes visit my Rosehill broadcasting box which was only a few metres from the press room. At age fifteen he joined the Bob Thomsen stable, learning the fundamentals from a master of the trade. He later accepted a job as travelling foreman for Bart Cummings, and got to look after equine superstars like Campaign King, Beau Zam, Tristanagh, Sky Chase and Kingston Rule. Next adventure was a trip overseas where he rode work for Clive Brittain in the UK, and Kevin Prendergast in Ireland. Back in Australia, and with his weight a respectable 52 kgs, Mark decided to become an apprentice jockey at the unlikely age of twenty three. He kicked off with Graham Begg, and finished his time with Ron Quinton. He was twenty seven by the time he forged an association with Gai Waterhouse, which lasted until 2016. He was eminently successful as stable jockey at Kembla and Newcastle meetings for some sixteen years, before being appointed assistant trainer to Gai in 2011. He rode 650 winners, most of them for Tulloch Lodge, and is proud of his three Kembla Grange jockey’s titles. He was quick to respond when asked to nominate the best horse he rode in a race. “Bentley Biscuit by a mile”, said Mark emphatically. “I rode him when he won a 1200 metres Maiden at Kembla in 2005, by eight lengths in track record time. He went on to win over $1.4 million, and three Gr 1 races”. Mark was confronted with a major dilemma in 2016, when the Tulloch Lodge business was sold to Chinese interests, and Adrian Bott was brought in as assistant trainer. He was offered an alternative role, but felt his position was untenable. “I was always going to become a trainer eventually, and this situation hastened my move in that direction”, said Mark over the weekend. He’s the first to admit he was a little lost as he kicked off with a few boxes at Warwick Farm, and just three horses whose futures looked pretty limited. “I’ll be forever grateful to a few special horses who got me off the ground”, said Mark. 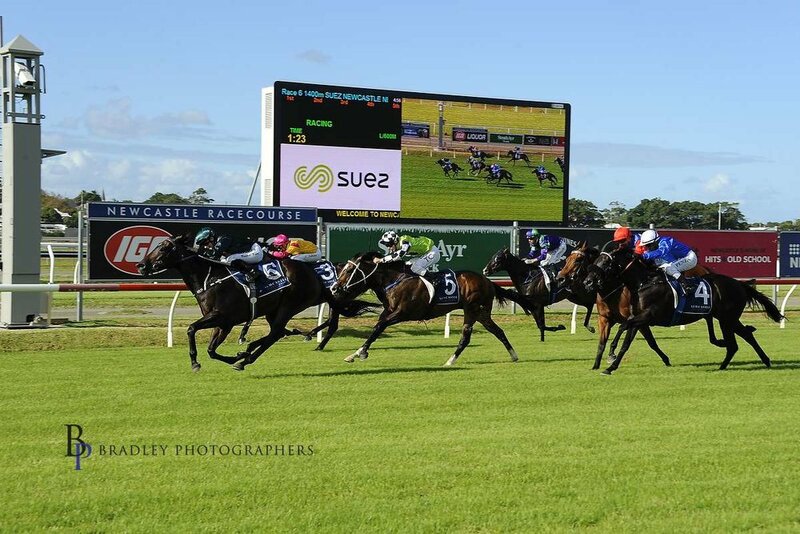 “Anisha won at Wyong and twice at Warwick Farm to the delight of the owners. A horse called Careless had been moved on by Godolphin after being stood down twice for barrier offences, but happily we were able to squeeze a win out of him at Randwick”. The horse to lift Mark’s profile is Lanciato, whose five wins to date include a Listed Carrington Stakes, and Group 3 Newcastle Newmarket. Anatola was good for the stable, winning three races including the Listed Silk Stocking in Queensland, and Burning Passion, not the soundest horse in the world, won the Gr 3 Hall Mark Stakes. Mark’s hopes soared in 2017 when Diamond Tathagata won the Gr 2 Skyline Stakes, and took his place in the Golden Slipper field, finishing well back on a heavy track. “He was the first yearling I’d been given to train, and it was a thrill to make the Slipper”, recalled Mark. “He didn’t come up next preparation, and has been retired to stud. But it’s Maid Of Heaven who has reserved a place in Mark’s heart. It takes a pretty special filly to give a trainer his first Gr 1 success, and to achieve that feat at her first serious preparation. At her first race start ten weeks ago, she was unplaced in a 2YO Maiden at Canterbury. She won a three year old Maiden on the same track two weeks later and followed that with a close up fifth in the Tea Rose Stakes after a chequered run. Then came a very good sixth (1.2 lengths) in the Flight Stakes, after being held up for a run on straightening. “The way she hit the line in the Flight, convinced me she deserved a shot at the Spring Champion Stakes, even though it meant backing her up quickly, said the trainer. “I never took my eyes off her feed bin all week, and she ate everything in sight”. 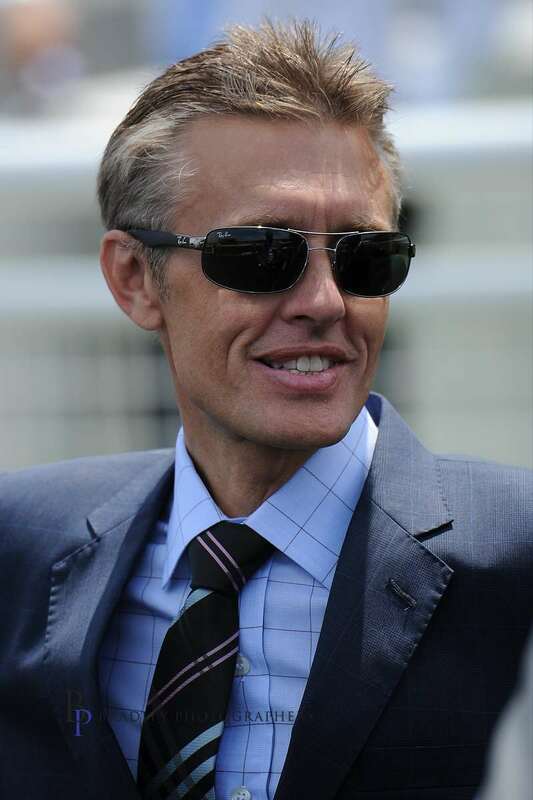 Mark has known Rachel King since the English girl began riding trackwork for Gai Waterhouse. “She has the perfect jockey’s build, and horses just love her to death”, said the trainer. “When jockeys regularly used by Arrowfield were unavailable, I strongly recommended Rachel to John Messara, and he was happy to give her the opportunity. An opportunity that has given her a prized Gr 1 victory”. Mark confirmed over the weekend that Maid Of Heaven will go straight to the paddock, as will Nakeeta Jane who finished a very close third in the Flight Stakes. That will leave him with Greysful Glamour as his lone representative in Melbourne during the spring carnival. This long striding grey Stratum filly, has continued to improve as the distances step up, and she was dominant in winning the Oaks Trial at Flemington on Sept 26th. Greysful Glamour will have a lead up run at Caulfield on Cup day, and all being well, will go straight to the Oaks. Mark Newnham must have been doing something right since going public just two and a half years ago, with only three horses to bless himself with. It’s well known that he’s operating stables at Randwick and Warwick Farm, and each venue houses thirty horses at last count. And that was before Maid Of Heaven threw in a Gr 1 on Saturday. Older PostTHIS GRAND LITTLE MARE REALLY IS A STAR!